Mr. 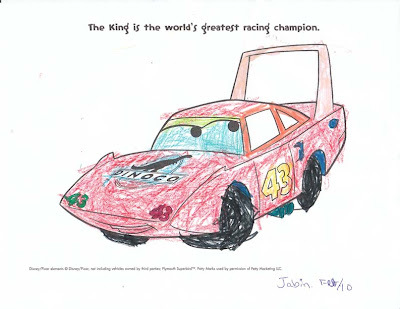 Independent: Jabin earned this title early on in life, always wanting to do everything himself from the moment he discovered food could come from something besides a breast. Lately, he has been pressing to remain the Reigning Champion of the title, no longer being happy to let someone else butter his bread, put condiments on his food, open his bananas, etc. For the most part, this is a welcome change--now, if only we could get him to figure out how to do up his coat zipper, we'd be laughing! Socks: Jabin was the lucky recipient of the first pair of socks I have ever made. I finished them Friday--one week per sock, with fairly consistent daily work on them. 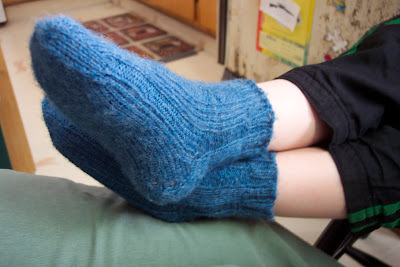 They are uber-cute, especially on his little footsies--but it didn't take me long to decide that the next pair would be made from a larger-gauge yarn! (I just don't want to take two weeks to make something as small as socks. Call me crazy if you must.) He loves them, which warms my cockles. How gratifying is it, after roughly 30 hours of work (and a new callous!) to tell the boy that his socks are finished and have him jump up and down excitedly while yelling "Yay!" not once, not twice, but thrice? Helping: Jabin loves helping--and he is getting old enough that occasionally, he can actually be helpful! Okay, he might not do the most stellar job of wiping down walls, sweeping the floor, or picking up toys--but he is trying, he's learning, and he loves feeling useful. Everyone's gotta start somewhere! Those socks are SOO cute!! I hope they last a LOOOONG time. I LOVE the socks! And the sweet little guy in them! :) Great job, Talena. Reading the last couple of posts I'm thinking how crazy it is that Noah is SIX. SIX! Then I had to do a search to find out how old Jude was because I was thinking maybe Jude was six but he's seven! And a half! Gee! What's with kids getting older! Is this going to be a continuing trend? They just never listen! I keep telling 'em to STOP with the growing, already! Sigh. I guess we can expect more of the same. Cupfins? Muffcakes? I dunno... Delicious!